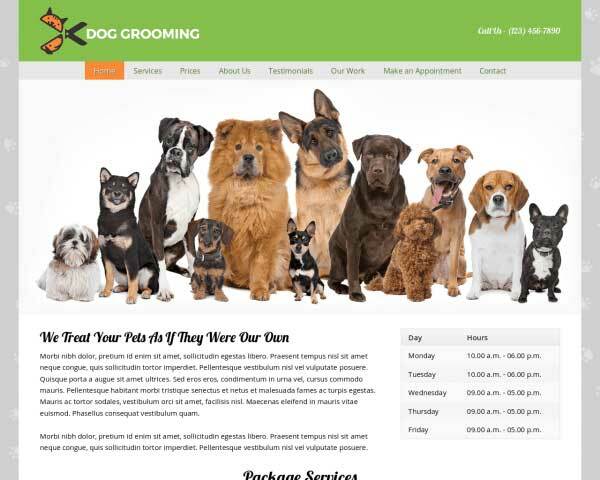 With a great-looking website representing your business online, you can attract new clients and meet more awesome dogs. 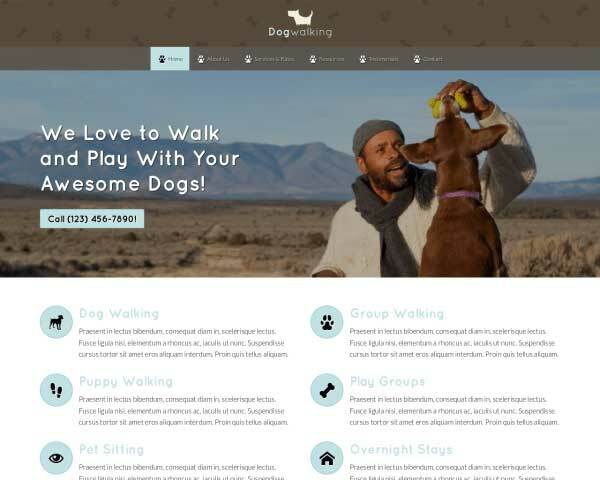 The Dog Walking WordPress theme is a pre-built website template that helps you get your pet care services online fast just by adding your own text and photos. 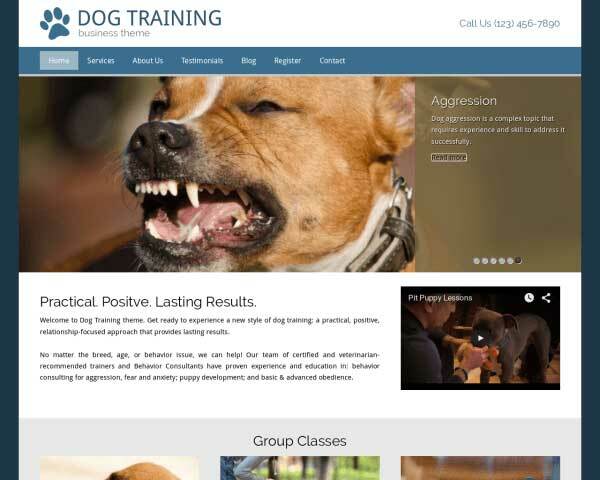 Grow your dog walking or pet sitting business with a professional website that shows clients the fun (and safe) times their dogs will have in your care! The Dog Walking WordPress theme is designed to help you quickly create an appealing and informative overview of your range of pet care services, providing you with a platform to express your experience and trustworthiness in one delightful package. 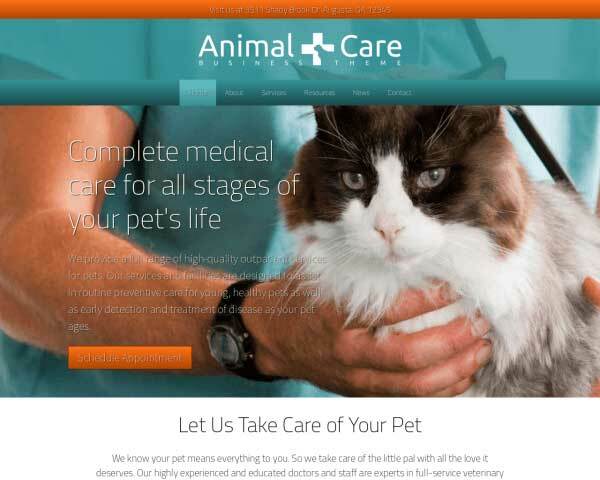 This pre-built website template is set up with pages for details about each of your services, client testimonials, your recommended resources for pet owners and more. The homepage grabs visitors’ attention right away with a photo slider, calls to action and links to important pages on your site. You’ll be able to change the color scheme and rearrange page layouts with any coding at all using our visual front-end editor. We’ve included premium features with this WP theme for dog walkers, like integrated social media options, lightbox image galleries, built-in rate charts, customizable contact forms and sleek responsive design that looks great at every screen size. 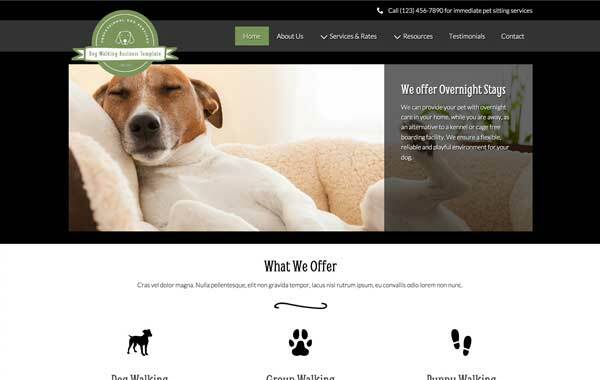 A professional website for your pet care business is within your reach when you start with the Dog Walking WordPress theme. 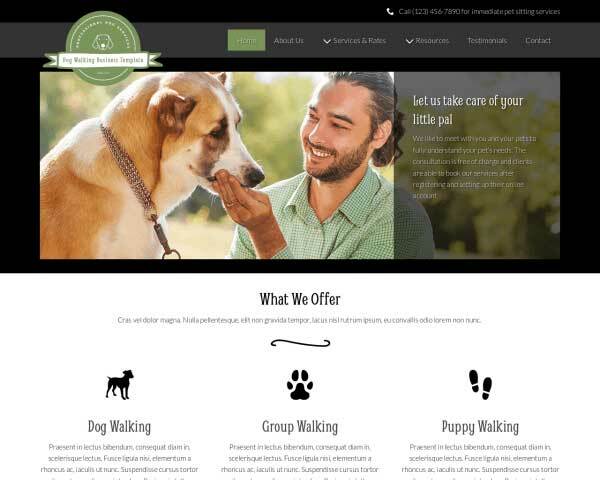 This Dog Walking WordPress Theme designed specifically for dog walking specialists. It includes all likely features your business needs and ensures you are up and running in no-time. Customers won't have to search to take the next step and get in contact with you with clear calls to action prominently displayed on every page of the Dog Walking WordPress Theme. An image slider has always been a great way to enhance the design of any website. This Dog Walking WordPress Theme includes a preconfigured slider which is incredibly easy to make your own. 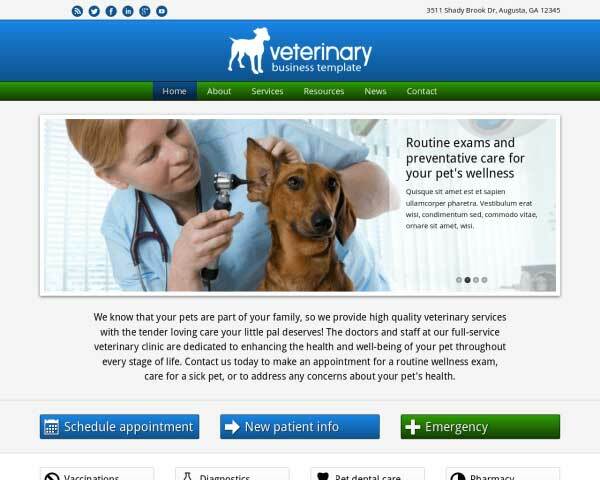 List helpful links for pet owners on the resources pages of the Dog Walking WordPress Theme, with individual pages set up for your recommendations on local vets, boarding facilities, pet adoption centers and more. An easily expandable rates overview gives your site's visitors clear access to your pricing structure. 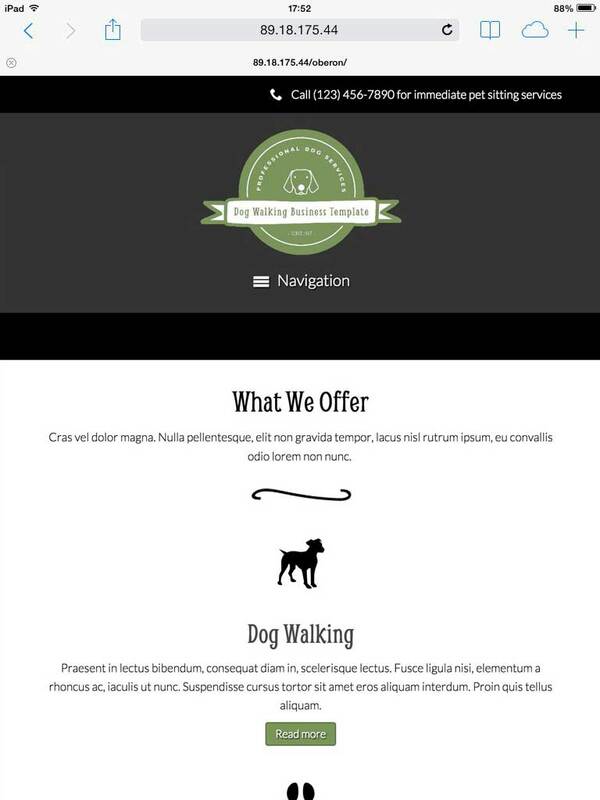 The Dog Walking WordPress Theme includes individual pages already set up for you to go into detail about each of the services your business has to offer to pique the interest of future clients. Allow your visitors to see an at-a-glance overview of your services, directly from the homepage of the Dog Walking WordPress Theme. 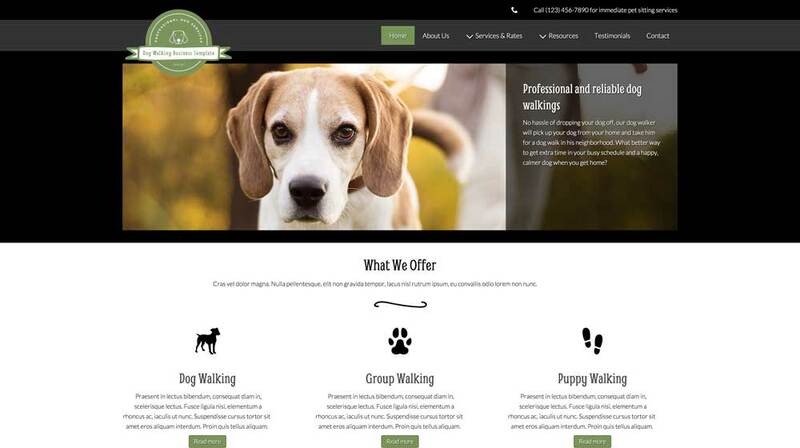 A great way to give your website a personal touch is to introduce your team of dog walkers. We've set up a page on the Dog Walking WordPress Theme with spots for profile pics and short bios. 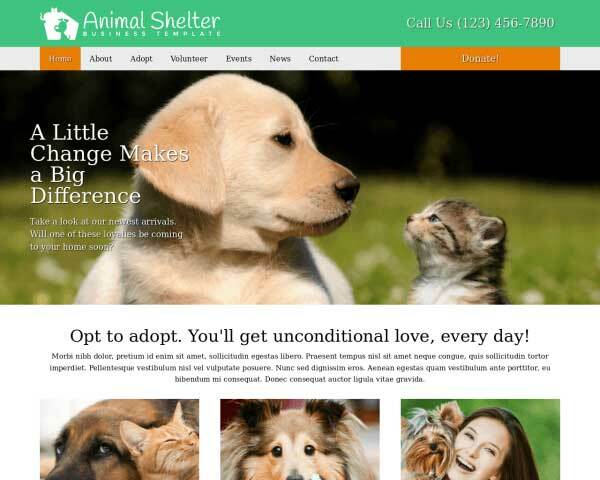 When you build your pet care business website with our responsive Dog Walking WordPress theme, great mobile design is just part of the package! No coding or plugins are required to ensure that visitors who browse your pages on smartphones and tablets will enjoy the same professional design and user-friendly functionality of the desktop version. 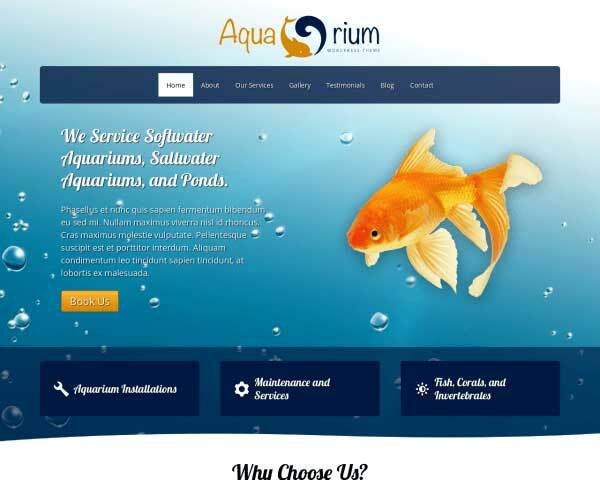 This mobile-optimized website template will automatically adjust the layout of your content based on the capabilities of each handheld device. 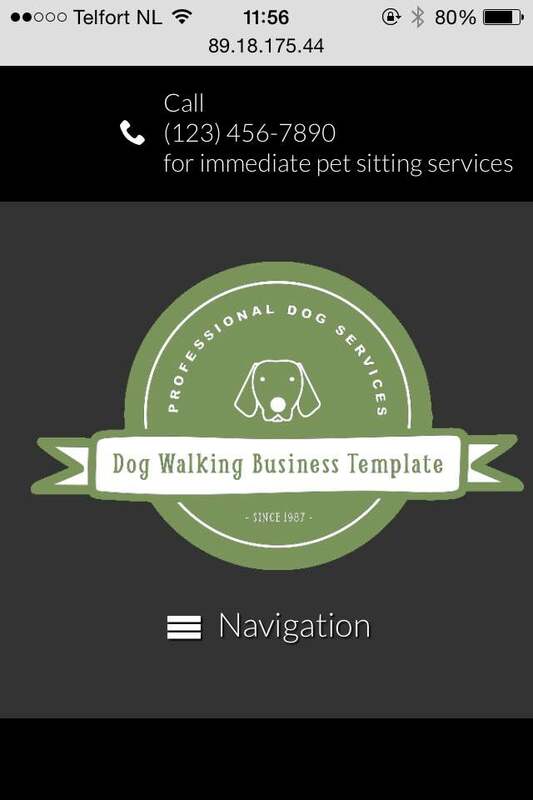 Pet owners on the go can simply tap your phone number to dial.